Mawddach Estuary01654 703435work RiverThe Mawddach Estuary is where the River Mawddach (Afon Mawddach in Welsh) meets the sea and forms a stunning wide sandy estuary. At the mouth of the Estuary is the town of Barmouth and 8 mile inland is the town of Dolgellau which is connected to the coast by the Mawddach Trail. The trail runs from Dolgellau to Morfa Mawddach, at the south side of the Barmouth railway bridge. The Mawddach Trail is managed by the Snowdonia National Park Authority. The trail is a leisure route for walkers and cyclists, and is part of the Sustrans Cross-Wales Cycling Route. 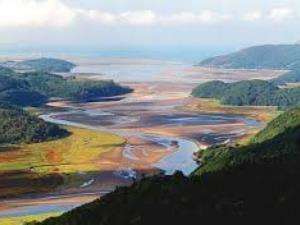 The River Mawddach is a river which has its source in a wide area north of Dduallt in Snowdonia. The river has many tributaries of a similar size to the main river. The catchment area is bounded to the east by the Aran Fawddwy massif and to the west and north by the Harlech dome which forms a watershed just south of Llyn Trawsfynydd. The estuary of the Mawddach was a great centre of ship building in the 18th century and probably for some centuries before, however there is little evidence remaining of this activity in the estuary today. Other past industries include gold panning in the River Mawddach at Coed-y-Brenin. The Mawddach Estuary is where the River Mawddach (Afon Mawddach in Welsh) meets the sea and forms a stunning wide sandy estuary. At the mouth of the Estuary is the town of Barmouth and 8 mile inland is the town of Dolgellau which is connected to the coast by the Mawddach Trail. The trail runs from Dolgellau to Morfa Mawddach, at the south side of the Barmouth railway bridge. Today the river sustains an important salmon and trout fishery and the countryside it flows through is some of the most spectacular and scenic in the UK.